Since a while, the basics to mobilize this processes are set at customers: The mobile devices and the infrastructure for secure connections are there. Just install our ready-to-use and field-proven packages to mobilize SAP PM and CS! 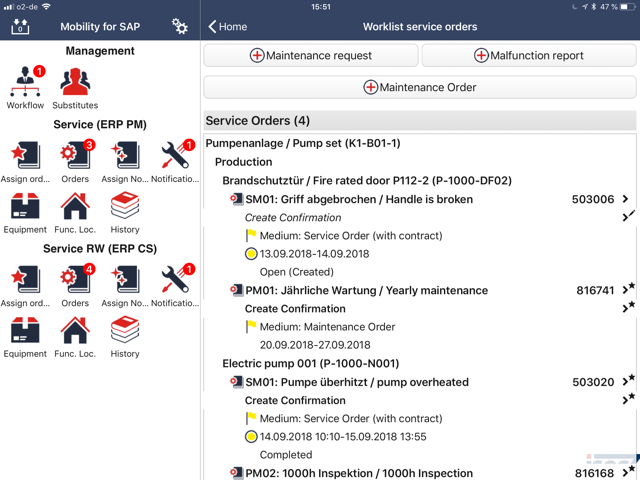 Mobile Inspection & Service supports your plant maintenance technicians or service technicians with smartphones and tablets at their daily work. The technicians get an overview about their worklist of orders and notifications, as well as all details that they need for an efficient work. Such as the details of the malfunction notification, the equipment or the historical notifications. After finishing the job, the technician is guided step by step through the confirmation, so all relevant data is captured, such as photos of the damage, checklists, working time, used materials, measurement point, activities, damage and cause codes. Off course this is done offline, as in the shop floor or in the basement you cannot count on a network connection. Exceptions are actions which work only onlibe, such as the availability check and reservation of spare parts. Therewith, the reservation can be executed directly and the spare part can be picked at the nearest warehouse. An additional benefit for customer service is to combine it with our sales package. The service technician gets enabled to answer sales related questions from the customer, such as the delivery date of spare parts or expendable materials, and enables him to capture new orders. Enhance the packages with an enhancement concept in pure ABAP to the customer specific requirements. Or mobilize your own processes! The packages are already available for S/4HANA or in development. Request a webex to see the functionality of the packages and to understand how easy the framework is. Or check out a customer case study here.